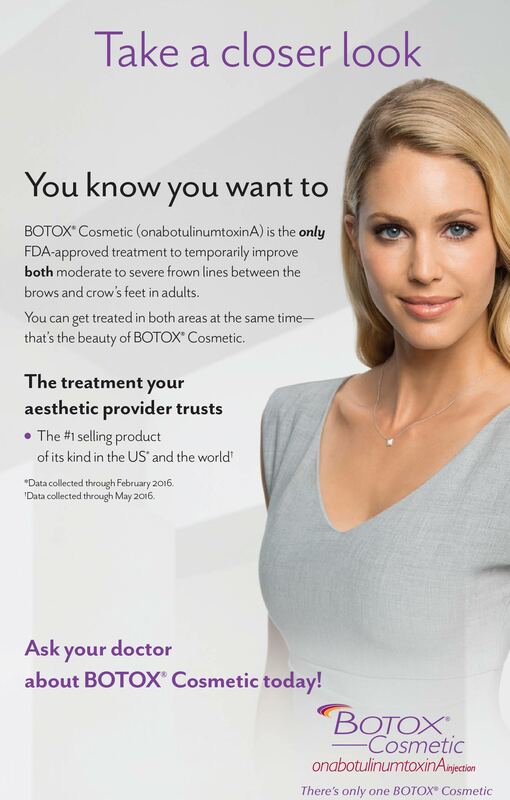 BOTOX Cosmetic (onabotulinumtoxinA) targets one of the underlying causes of frown lines and crow’s feet— the repeated muscle contractions from frowning and squinting over the years. 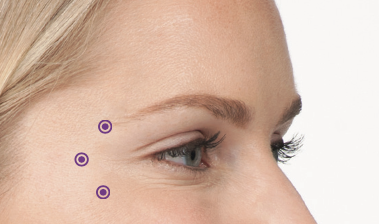 BOTOX ® Cosmetic temporarily reduces this muscle activity so you’ll begin to notice a visible smoothing of these lines. 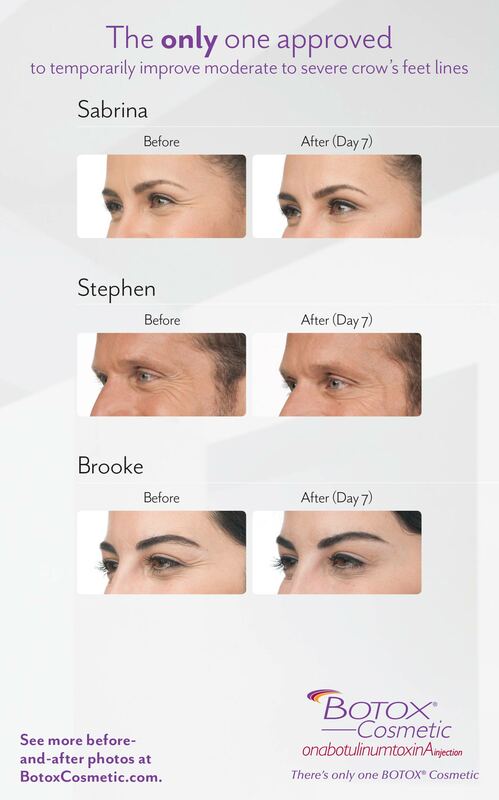 For temporary improvement of moderate to severe crow’s feet, your doctor will inject BOTOX ® Cosmetic into the muscle surrounding the sides of your eyes— called the orbicularis oculi muscles. 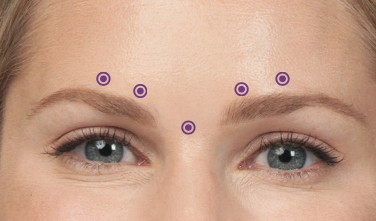 For temporary improvement of moderate to severe frown lines, your doctor will inject BOTOX ® Cosmetic into 2 muscles—the corrugator and procerus muscles. 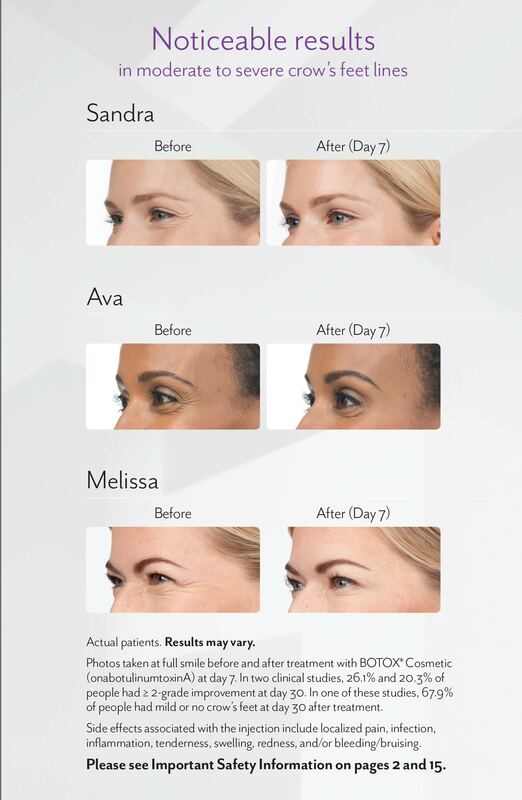 Tell your doctor about all your muscle or nerve conditions, such as ALS or Lou Gehrig’s disease, myasthenia gravis, or Lambert-Eaton syndrome, as you may be at increased risk of serious side effects including dif culty swallowing and dif culty breathing from typical doses of BOTOX® Cosmetic (onabotulinumtoxinA). Tell your doctor about all your medical conditions, including: plans to have surgery; had surgery on your face; weakness of forehead muscles: trouble raising your eyebrows; drooping eyelids; any other abnormal facial change; are pregnant or plan to become pregnant (it is not known if BOTOX® Cosmetic can harm your unborn baby); are breast- feeding or plan to (it is not known if BOTOX® Cosmetic passes into breast milk). with certain other medicines may cause serious side effects. 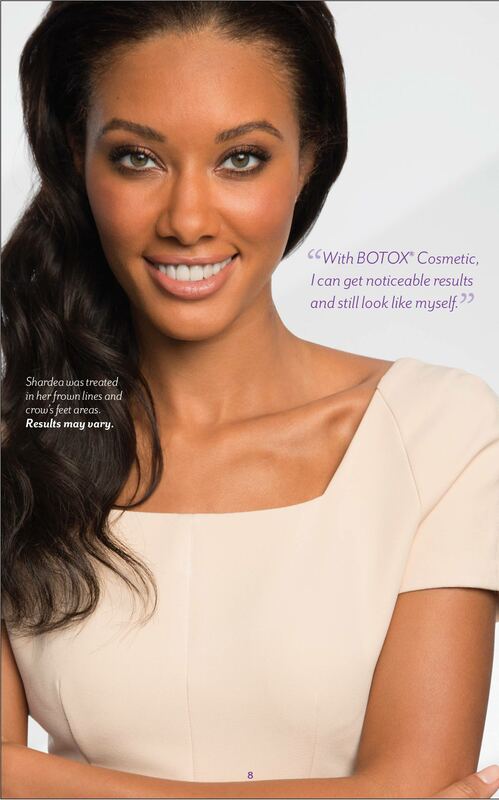 Do not start any new medicines until you have told your doctor that you have received BOTOX® Cosmetic in the past. For more information refer to the Medication Guide or talk with your doctor. Toreportasideeffect,pleasecallAllerganat1-800-433-8871. 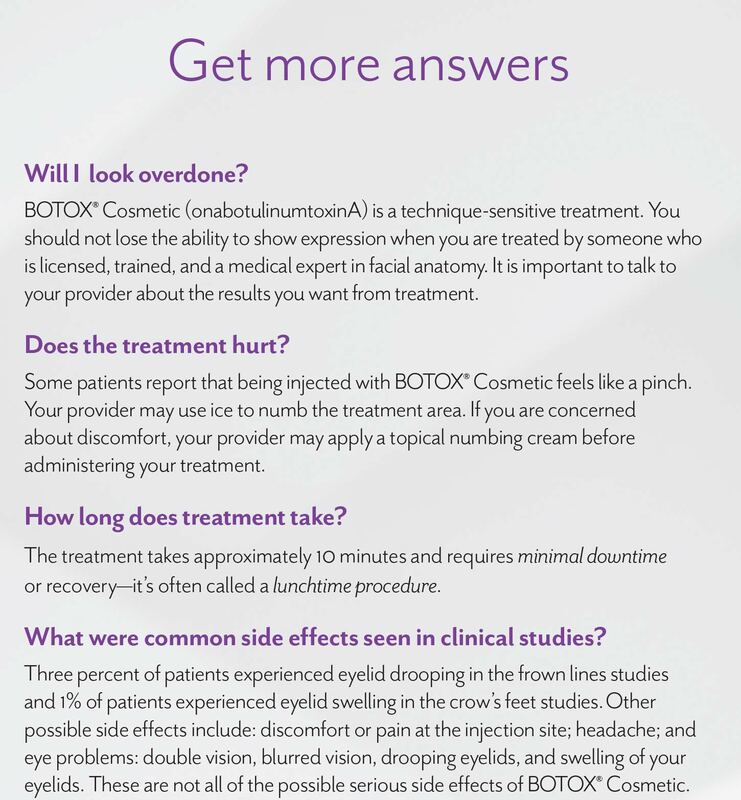 Please see accompanying Summary of Information about BOTOX® Cosmetic.